Weekly Photo Challenge – Angular | It's a Wonderful World! When I first read the word “Angular”, I immediately thought of the pyramids of Giza, Egypt, the ancient iconic structures that we see resonated in plenty of instances in modern day architecture. Alas, I have not been to Egypt and witnessed the pyramids firsthand. So, for this week’s photo challenge – “Angular”, I have settled for I.M. Pei designed Glass Pyramid which along with three smaller pyramids, sits proudly with all its glass and metallic splendor in the courtyard of the Louvre in Paris. This picture was taken on a cold and cloudy February afternoon in Paris. For more takes on “Angular” theme, click here! 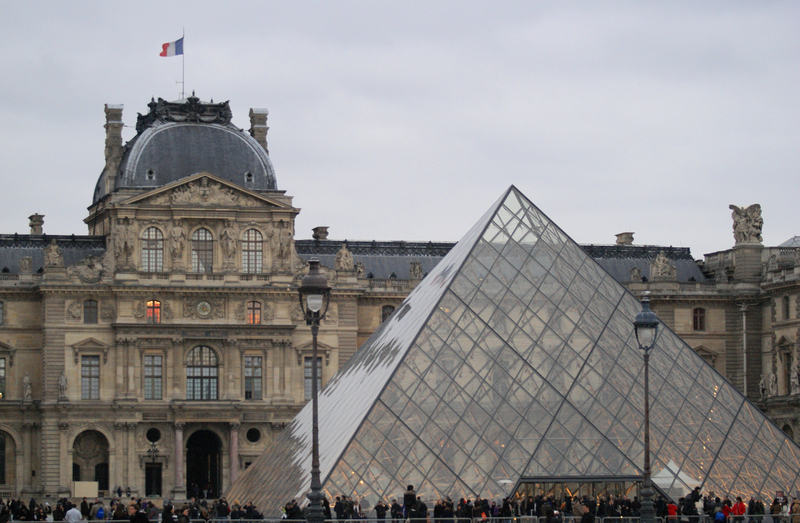 Having visited the Pyramids and the Louvre, I would say I prefer the Louvre…I felt a little disappointed with the Pyramids but I could spend hours if not days exploring the treasures of the Louvre… The French flag and the two lit windows in your picture make for an interesting image.